Over the last century, the original expansive parkland of the Charles River Esplanade has been carved away to carry automobile traffic. Currently, where Storrow Drive passes beneath the Longfellow Bridge, the eastbound and westbound lanes are given one bridge span each. Working with the Esplanade 2020 Work Group, RBA put on our traffic-engineer’s caps to prove the feasibility of routing all lanes of Storrow Drive under a single bridge span. The result would be a widened strip of Esplanade parkland that takes advantage of the riverfront span. The study area was an unruly tangle of intersecting of expressways, on-ramps, and surface parking, and RBA worked to carefully unknot the chaos into a workable solution. 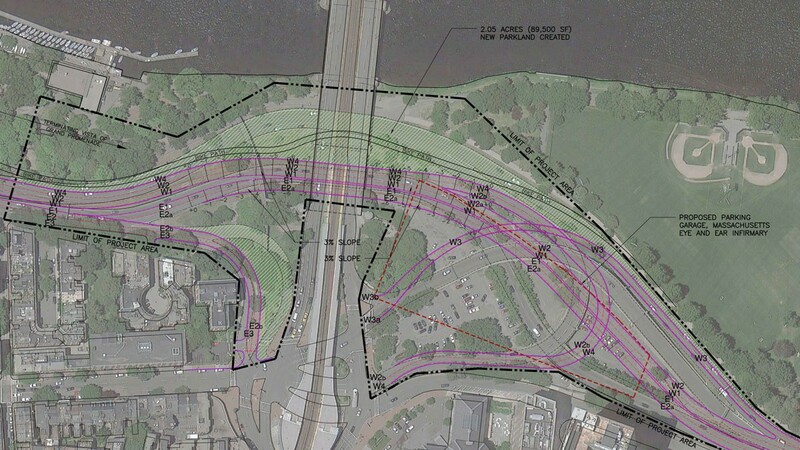 RBA’s drawings have demonstrated to various city and state agencies that the riverfront bridge span can be reclaimed as a wide swath of parkland and provide safe bicycle connectivity. Efforts are currently underway to implement these changes, with the Massachusetts Department of Conservation and Recreation collaborating with the site’s abutting land owner, Massachusetts Eye and Ear Infirmary.